This is for one 16oz bottle of Oxygenated water or to upgrade an existing elixir and make it oxygenated. The energy cost to operate is nominal, and after 20 minutes, the water will hold up to 99 percent dissolved oxygen, which greatly enhances the taste of the water. The "complementary medical" aspect of The Big Pitcher assumes that more of this type of oxygen to the body is favorable. It is a scientific fact that bacteria, viruses and fungi cannot survive in an oxygen-rich environment. As such, the lack of sufficient oxygen becomes a significant contributor to disease and ill health. One way to increase the amount of oxygen available to our tissues, is to drink an oxygen-rich water. Oxygenated and oxygen-enriched water is a relatively new idea in the marketplace, in which water is specially treated using unique proprietary methods to enhance the level of saturated oxygen. 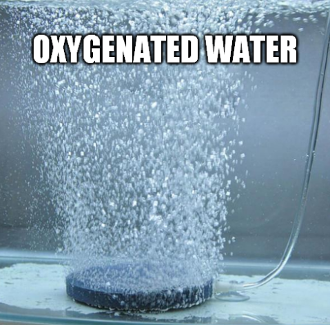 The enrichment processes that create oxygenated water are similar to the way extra amounts of saturated carbon dioxide are added to soft drinks. Extra oxygen offers several benefits. The main benefit relates to the health-affirming aspects of extra oxygen being conveyed directly to the body through absorption upon consumption. Water is essential to hydrating the body, especially when exercising or playing sports. Oxygen-enriched water, compared to filtered water, greatly reduces lactic acidosis (internal muscle burn) and enhances overall performance output, allowing longer aerobic workouts and faster recovery times. With higher levels of oxygen in the blood from the oxygen-enhanced water, all biological waste and by-products from body functions are easily reduced through oxidation. This effectively deactivates potentially toxic substances and allows for faster and safer elimination cycles via skin and urine. Oxygen has been also shown to enhance immune functions, which can be a major benefit for many health-related conditions. In addition, reducing toxic buildup has long-term beneficial effects because toxicity is the general cause of most degenerative diseases. The overall effect on the body is one of enhancing all body functions, reducing toxic buildups and enhancing waste elimination, thereby promoting good general health.